An audio version of this story can be heard on Episode 3 of Slack’s podcast Work in Progress, about the meaning and identity we find in work. In her former profession as a behind-the-scenes number cruncher at a bank, Bailey didn’t feel challenged. “I was in my comfort zone, and it was paying the rent,” she explains. 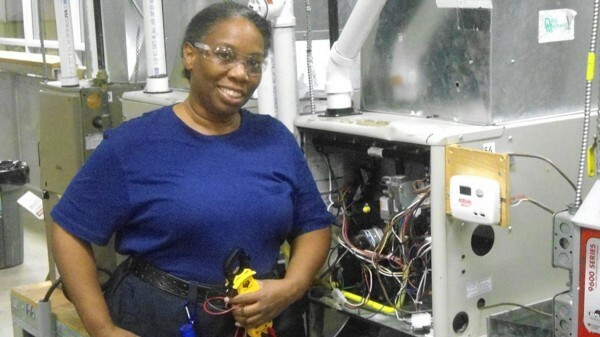 Despite her passion for mechanics, she never dreamed of going back to school for a certification in HVAC — heating, ventilation, and air conditioning. Bailey came from a family of achievers, and hers was a quiet success by choice. Her oldest brother was killed in a random act of violence when he was a 19-year-old college student. Bailey was just 13 when it happened. Grief does different things to everyone. Bailey’s other siblings reacted to the tragedy by pursuing service-oriented careers in their community. Her sister, for example, became a registered nurse. But Bailey felt far more trepidation in the shadow of their collective loss. She dealt with her brother’s loss by trying to minimize threats in her own life, which meant she took precautions in her professional life as well. Though her job at the bank wasn’t glamorous, she was good at it. More importantly, it didn’t feel risky. “[My siblings] put themselves in harm’s way, and I chose a safe job,” she says. But Bailey’s real strength was in tinkering — something she’d long ago left behind. She was talented and enthusiastic about that type of difficult technical work, but she never thought it could offer her a career path. So at the time, it didn’t seem lucky when Bailey was laid off from the bank and then laid off again from her next job. She had young children and needed the same sort of stability she enjoyed in banking. After failing to get her foot in the door elsewhere, she thought that going to community college to train for a new line of work seemed like her best option. Since she was good with people, Bailey’s daughter suggested she try event planning. But something fortuitous happened when Bailey was enrolling in classes. One of the school’s admissions counselors noticed her nearly imperceptible hesitation and asked if she happened to enjoy more hands-on work. Bailey mentioned her experience fixing the household plumbing. There wasn’t a plumbing program available, but the counselor mentioned that she should consider HVAC. “I really like working with machines,” Bailey admits with a laugh. She decided it was finally time to take a risk. Determined to do something she loved, Bailey wasn’t deterred when she was only one of three women in the class, nor was she deterred by the fact that she was the oldest student. “I’ve always been a survivor,” she says. Work in Progress story produced by Tara Brockwell. Brittany Shoot always wanted to be a writer. A detour to film school helped her realize she’d rather hold a pen than a camera.